Light Therapy Regeneration - 'red light therapy' for collagen production and 'blue light therapy' for soothing and healing problem skin. The system not only works to restore and refine facial muscles, it also plumps out and softens deep lines and wrinkles using the Ultra's unique wrinkle comb which is an alternative to dermal fillers. The CACI Ultra is also effective at treating acne, blemishes, reducing the appearance of scar tissue and stretch marks. For more information or to book a CACI Ultra treatment please call 01280 813000. The CACI Classic works to restore and redefine facial muscles, reducing lines and Deep wrinkles. After a course of treatment you will see significant improvement to the contours of your face and the condition of your skin. It can also be used on the body to tighten and tone sagging body muscles. By targeting several treatment areas at the same time, the CACI Quantum, not only achieves fantastic results but also saves you time and money. The CACI Quantum treatment programme consists of a course of ten deeply relaxing treatment sessions, followed by a maintenance programme to suit your individual needs. 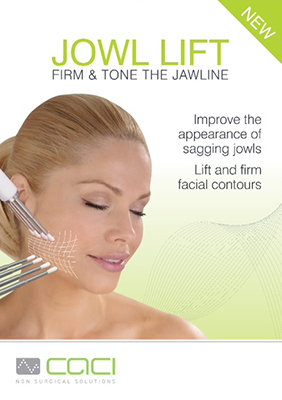 CACI Quantum face and body toning is available in our Stowe Castle salon - call 01280 813000 for details. Target the specific area that bothers you, it only takes 35minutes for a fast effective facial treatment. Eye Lift works specifically around the eyes to firm the brow line and reduce puffiness and bags to maximise a youthful fresh face. Contact us to book an appointment at one of our salons. Or book online if you have already registered with us! Tightening and toning sagging body muscles, with modes for slimming, contouring, cellulite and lymphatic drainage. The unique roller bars achieve excellent results on problem areas such as the abdomen and bust, (both particularly difficult to tone after childbirth and surgery). Stretch marks and scar tissue can also be successfully treated. Please call us on 01280 813000 for an assessment of your requirements. A personalised package of treatments can then be arranged. Enjoy the convenience of receiving a body treatment whilst simultaneously having a facial and save 50% on the cost of the body treatment. Copyright © 2019 The Beauty Therapy Centre. All Rights Reserved. The Beauty Therapy Centre is a VAT registered business. Reg no:992737566. A 2% charge applies to payments made by credit card. Web design by Eau Rouge Ltd. A graphic design agency in Buckingham.